Last week we began our discussion by articulating the reality that in today’s modernised, technologized culture we are prone to intellectualising the parts of our being that are innately not designed to be conceptualised. We considered in detail the physiological and psychological effects of denying the intuit – of what it means to live in deep suffering, denying our true heart's desire. We delved into the reality of what science now proves – that we can die from an emotional stress so grand it suddenly weakens the muscular portions of the heart and causes a response similar to a heart attack. 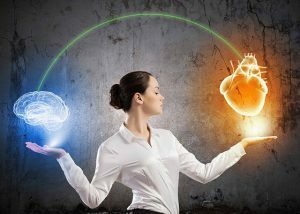 Through the condition known as Takotsubo cardiomyopathy, or stress cardiomyopathy, we can begin see that our hearts are an intrinsically embodied part of our consciousness. Furthermore, with this in mind, we can acknowledge that it is not only grief and loss that can trigger symptoms of chest pain, shortness of breath, sweating in excess, dizziness, nausea and vomiting, weakness, or heart palpitations, however so too: social rejection, continual disingenuous connection, insecure attachments that lead to continued heightened anxiety or disassociation, feelings of denigration and devaluation, and un-compassionate communication. Indeed, embodied consciousness that continually reflects negative interactions can lead beyond stress cardiomyopathy and towards acute heart failure, lethal ventricular arrhythmias, and ventricular rupture! We reiterate this because, as those who have or are suffering know, quite often society, or the people within our culture, place a persistent pressure on the notion that we need to “get over it” or “fix it” (whatever the “it” for you maybe). Yet when we came to acknowledge that, even in an overtly intellectualised world, there is a sense of knowing that stems deeper than anything that can be worded or visualised, we can come to a place where our suffering can be seen for its reality, and our heart felt desires can be truly felt and cultivated through the power of true intention. Indeed, Dr Dan Siegel (2012), Interpersonal Neurobiologist, states that although the expression of our realities can be shared through words, images, or other creative expression, and can perhaps illuminate that which otherwise would not be able to be conveyed, these expressions are not to be mistaken for reality. Meaning, that “we must let go to see the nature of what is actually there in front of our eyes” (p. 21-13). It is in this letting go to what is in the here and now that opens the path to the power of the intuit heart and the power of the intent to feel. The question is, how do we get to a place where we can create a lasting, replicable change to our nervous system, blood stream, and brain? How do we come to the place where we first feel what is beyond limiting expression, and then cultivate a new feeling? Ultimately it stems down to the question: how do we connect with our innate being, the spirit within us? Though these questions could be answered in a multiplicity of ways, there is one certainty that comes from the true unifying goal of Yoga: that there are metaphysical practises whereby a slowing down of the learned turmoil our minds create allows for a deep grounded presence in which connection to your innate being opens the path to truly “feel” and connect with the spirit within, and thus begets a process whereby we can then cultivate how we want to feel on a daily basis! In deep grounded presence (meditation), where by withdrawal or control of the senses (what might also be seen as a withdrawal from or control of human derived stimulation) is cultivated, we can truly engage with our own internal senses (or our peripheral nervous system), and in a way we “lose our (conditioned) minds” and find our hearts. Though this can be done in a multiplicity of ways, indeed we often create new intentions through the expression of creating internal or external images (bhavana) or use words (sankalpa) to move towards our hearts desire, there is the aforementioned limitations this brings – while they may represent a new reality, our inherently deep connection with our innate being knows that these words and images are mere representations. Therefore, for a true heart felt intent, we must indeed feel. 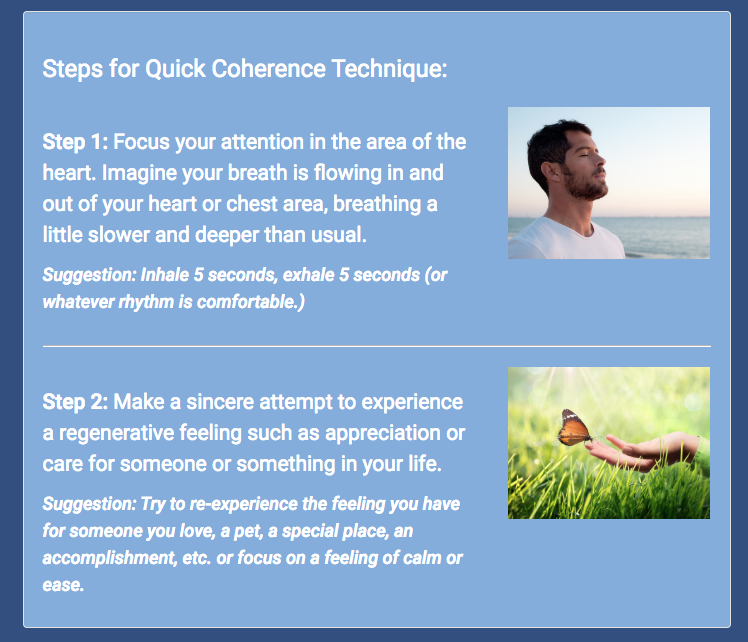 Called the quick coherence technique this brief meditation is a daily practise whereby your intention to feel more than suffering begins to create lasting changes within your embodied consciousness. The intention of feeling, to cultivate a feeling rather than to mindlessly or even mindfully just feel, creates a cascading effect throughout your entire body. This is not something to be ignored! Again, we see that the science of the heart shows what ancient tradition has known for millennia – that meditation comes from the heart. That, to rest in the peace of a moment and to set an intention to be more, creates a field of electromagnetism that enhances not only our innate being, but so too the innate knowing of humanity as it relates to the earth. As the above coherent heart practise demonstrates, when we come into our heartfelt desire we wisely place our hands on our hearts and we focus our attention on the energy that surrounds it – not only our physical bodies and all that it encapsulates, but the spaces that surround our being (generally a few feet), and we can begin to truly feel all that this incredible existence has to offer us. ancient tradition has understood, and practised heart felt desire and intention, and indeed cultivated peace-based societies for century’s. To this day, Tibetan Buddhists laugh at our western need for proof and measurement with EEG’s, they know, and have proved from their inspirational way of well-being, that our hearts are more than a muscle. Our hearts are, and have always been, the core of our being. They have the capacity to feel what is beyond our ability to express, and it is only when we choose to tap into our true being, either in our suffering or in our true heart’s desire, can we choose to change our intentions and our state of being. Choose to cultivate a new heart’s desire. Choose to let us help you to understand all that is within you, to create a new heart’s desire, to move through the grief and trauma of your past, and to create a pathway towards holistic well-being. Join us in May and June for either or both of our integrative and evidence-based retreats. Taught by both Leanne Davis & Celia Roberts, this weekend explores the true nature of your heart. Clinical Yoga Therapy: Thyroid and Autoimmune disease, Anaemia, Malabsorption; Meditations for Healing Relationships; Yoga for a heart centred life - developing an intuitive heart. Learn new ways of looking at mental health. This weekend explores Ayurvedic and Yogic Psychology to heal the mind, Emotional Anatomy, Depression, Anxiety, Stress, Addictions. Meditations for Pacifying the Mind, and Yoga's Matrix - healing the mind, the brain and our emotions.